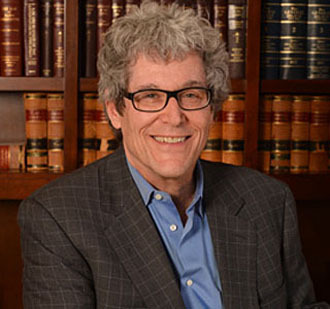 Donald Passman has been a top attorney in the entertainment field for over three decades. Practicing law at the Los Angeles-based firm of Gang, Tyre, Ramer & Brown, Inc., he represents such top music artists as Taylor Swift, Adele, Green Day, Pink, Paul Simon and many others. He is also the author of the definitive music business book, All You Need To Know About The Music Business, which has sold several hundred thousand copies. Passman has just written the ninth edition of this book, which has just been released. Passman was was responsible for the record-breaking “mega” deals for both Janet Jackson and R.E.M., and has negotiated deals for many other major artists. A graduate of the University of Texas and Harvard Law School, Passman is listed in The Best Lawyers In America. In addition, Passman has lectured extensively on the subject of the music industry, including teaching a course at the University of Southern California Law School’s Advanced Professional Program, and lecturing for the UCLA Entertainment Law Symposium, Harvard Law School, the American Bar Association, and other institutions. He is also the author of three novels, including The Amazing Harvey, The Visionary and Mirage. The new edition of Passman’s book, All You Need To Know About The Music Business, is an updated and comprehensive guide to the music industry. It’s highly recommended for anyone in the music business—songwriters, artists, musicians, managers, agents, publishers, executives—trying to navigate the rapid transformation of the industry. We are pleased to do this new Q&A interview with Donald Passman. He discusses the new edition of his music business book, and offers insights into music streaming issues, current record deal contracts, and song copyrights. DK: In your new book edition, what are the main revisions that you’ve made? Passman: A complete update of the latest digital developments. I also discuss the potentially game-changing issues for performing rights societies (ASCAP, BMI, SESAC and Global Music Rights), who collect “performance monies”. 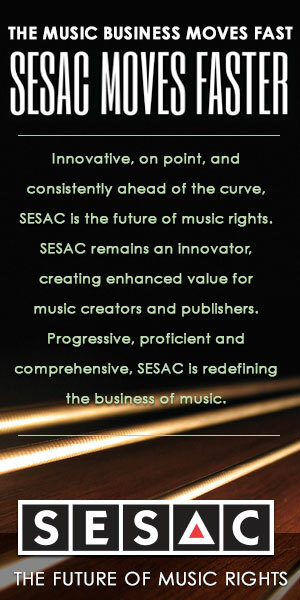 That means monies paid whenever your song is used on the radio, TV, nightclubs, and elevators. There are things happening that could end up restructuring the way performance monies are collected. DK: What are the latest developments with music streaming royalties for both artists and songwriters? Passman: Streaming continues to grow, and I predict it will be the dominant way of delivering music in the future. The industry has settled into paying artists their royalty rate, applied against the streaming revenue. Songwriters get their normal percentage of streaming money from the publishers, who collect it for them. DK: Several hit songwriters have publicly complained that music streaming companies like Spotify and Pandora are not paying sufficient royalties. What needs to be done to rectify this? 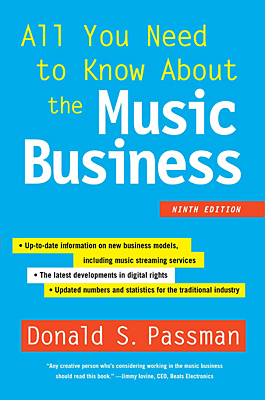 The cover of the 9th edition of Donald Passman’s book, All You Need to Know About the Music Business. Passman: The real way for royalties to increase is to get away from the “freemium” approach (ad-supported streaming which is free) and to adopt a subscription pay service. Many people in the music industry are closely watching the new Apple Music, which has charges a monthly subscription fee (following a free, 3-month trial period). We’re hoping that it works, so that the industry gets away from freemium, or at least makes it a short limited window where users would be able to listen to songs for free. DK: Regarding label deals, what are the latest changes to recording contracts in this digital age? Passman: Record label contracts have not changed dramatically in the past couple of years. Labels are being more aggressive about signing artists to 360 deals and increasing their rights and percentages (from music publishing, touring and merchandising). The range of percentages that artists pay to labels varies greatly, from 10% to 35%. The most common percentage is between and 10% and 25%. Some labels now want to actually own the merchandising rights (as opposed to just getting a share of income), since some labels now have their own merchandising division. DK: If you’re an artist, is signing with a major label still the best way to go? Passman: It depends on your goals. A pop artist who wants worldwide success still needs a major label. A cult or niche artist could be better off doing it themselves (or with an indie label). They might not sell as much, but they would be getting a greater percentage. DK: Particularly for older songwriters, recapturing their song copyrights is an important concept. Is this discussed in your book? Passman: Yes, recapture of copyrights is discussed in the book. In the United States, the copyright law says that a songwriter can recapture a copyright 35 years after the original grant or assignment. This is for songs written after January 1978. For songs written before 1978, they can recapture their song rights after a period of 56 years, but if they don’t recapture the rights after 56 years, they have another chance to recapture the rights after 75 years. For more info on Donald Passman’s book “All You Need To Know About The Music Business,” here’s the link: Donald Passman book on the Amazon site.